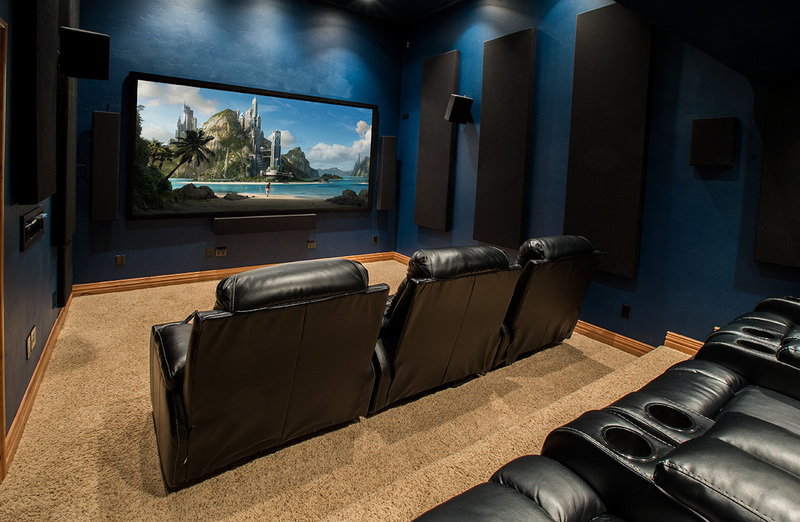 When setting out to design a Home Theater, there are some common mistakes. Here are my top 10. Speakers in the wrong place will ruin the illusion that the director was trying to create. The goal is to make you believe what is on the screen. The sound when a car drives across the screen pans from left to center to right creating that illusion. If the speakers are up by the ceiling, it just doesn’t work. Another common mistake is to put surround speakers high on the back wall. With speakers in that location, your mind will tell you that the sound is coming from the front of the room. Surrounds are effect speakers meant for a sound that is off screen or thunder in the distance. If it seems to be coming from the front, the illusion is ruined. Speakers in the wrong place is just a bunch of noise in the room. Poor quality speakers will not sound realistic. And realism is what it is all about. You want the huge door to rattle the pictures on the wall when it slams or breaking glass to sound like breaking glass. Don’t be fooled into thing that realistic or quality sound can come from tiny plastic boxes. Sound is physics. It just can’t be done. Speakers on shelves should be pulled out flush with the front edge of the shelf to avoid diffraction. Speakers in cavities in shelving units must be wrapped in foam or other acoustical dampening material a nasty hollow resonance. If speakers are ported out the back, either plug the port or find another speaker. Select your equipment carefully. Too often I see million dollar receivers with 50 cent speakers. This usually comes from the salesman at the Big Box store convincing you that you need the biggest and best. Once you have a budget, select your speakers first and then get a matching receiver. the savings from doing it yourself quickly disappears when you purchase an unbalanced system. There is a lot of hype in the world of cables when setting up your home theater. You can easily be oversold by a well meaning sales person. For speaker wires, there are charts that can tell you exactly what gauge you will need for any given length. Know if you will need in-wall rated cables. There are important specifications that HDMI cables will need to have. Find out if the less expensive cable has them. HDMI cables longer than 35′ will need special attention. In today’s world of wireless everything, some will tell you that you no longer need to be concerned with pre-wiring a new home, remodel, or basement finish. Don’t believe them. “Wireless Speakers” is one of the most misunderstood terms out there. Only the signal can be sent wireless. Once you get there you will need speakers, an amplifier, and power and yes, wires. The only true wireless audio system would be a battery powered boom box. Furthermore, devices such as smart TV’s, receivers, streaming devices, blu-ray players are infinitely less reliable than when hardwired. Don’t stack your equipment on top of each other in your home theater. Heat is the biggest enemy of electronic equipment. Something as simple as kids building blocks between them will help. A well designed equipment rack or properly vented cabinet will extend the life of your equipment. All too often, I see systems with all the cable corrections correct but non of the menus have been addressed and set up properly. These devices are not plug and play. You are not getting your monies worth if the setting are not correct. New receivers come with calibration microphones. Typically they are ignored or when they are used, they aren’t checked to see if they are accurate. I like to say they are 85% accurate 50% of the time. They can get you in the ballpark, but then you should go back and fine tune it. The wrong size screen will affect the movie watching experience in your home theater. If you have a great audio system with a 50″ TV viewed from 15′, you won’t be happy. There are charts and rules of thumb for seating distance for any given screen size. A screen can also be too big especially with projection systems. A properly sized screen along with a correctly install quality sound system will be huge in your movie watching experience. Furniture arrangement can also important in designing a complete system. The cheapest way to get a bigger TV is to sit closer. I can’t tell you how many people get their system set up and then proceed to use 5 remotes to get everything working. There is usually only one person in the house that knows how to operate it. A properly programed universal remote is a must for your new home theater.